Liver is one of the most important organs in your body. It performs many functions including detoxification of your blood and, breakdown and assimilation of nutrients. Without it, your body cannot function. Liver damage often goes unnoticed until it’s in the advanced stages. The condition can be caused by a number of factors like genetics, poisoning, excess alcohol intake or long term sickness. Understanding the symptoms of liver damage can help you get diagnosed and treated early. Five of the common symptoms to look out for include the following. Most people will associate a swollen abdomen with obesity or pregnancy. However, it might also be an indicator of ascites. This is a condition characterized by fluid buildup within the abdominal area. Ascites is known to be caused by a damaged liver. Common causes the condition are alcoholic liver cirrhosis, liver cancer. Besides a swollen abdominal area, patients suffering from ascites will also experience swelling of the legs. Treatment of this condition includes reduction of sodium intake in the diet and administration of diuretics. If left untreated, liver transplant might be necessary. Jaundice is one of the easiest ways of detecting liver damage. This condition is characterized by yellowing of the skin and the whites of your eyes. This condition occurs when the liver isn’t able to effectively remove bilirubin (bile) from red blood cells. Treating jaundice requires diagnosis and treatment of the underlying liver disease. Pain in the upper right abdominal area might be an indicator of an inflamed liver. Liver inflammation is caused by a number of conditions including viral hepatitis, cirrhosis and ascites. In some instances, taking pain medication might provide some temporary relief. However, over the counter medication might not treat the underlying cause of the inflammation. In addition, some over the counter medication can contribute to the development of liver damage. The color of urine and stool might change every once in a while depending on what you eat and drink. However, if your urine turns a pale yellow and stool becomes lighter and remains that way for a long time, you might have liver disease. 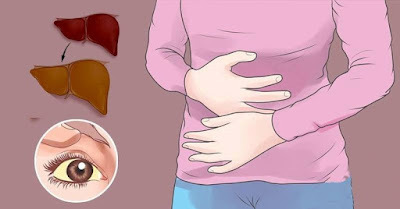 One of the primary functions of the liver is the breakdown of bilirubin and facilitating its removal from the body through stool. Stool gets its brown hue from bilirubin. In the case where the liver is unable to breakdown bilirubin, it passes on to the kidneys and is excreted in urine. This turns urine dark yellow while stool loses its dark brown color. One of the most common symptoms of liver damage is constant fatigue and muscle weakness. It can also indicate that the damage is in the advanced stages. One of the functions of the liver is the storage and breakdown of glucose which fuels the body’s cells. A damaged liver cannot effectively release glucose that’s needed for the body’s energy requirements. As such, patients with liver damage will experience chronic fatigue and in serious cases, it can lead to mental confusion and even coma. Liver damage can be characterized by a number of symptoms. If detected early, the condition can be managed and treated. It’s therefore important that you consult with a physician if you experience any of these symptoms.